This is the 4th Annual Mark Tucker Foundation 5K. 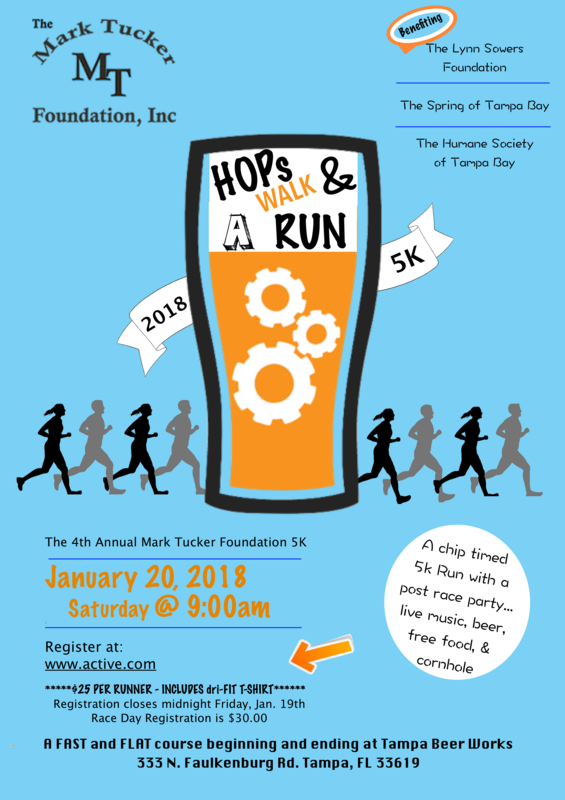 This 5K is a fast and flat course up and down Faulkenburg Road starting and stopping at Tampa Beer Works. There will be a post race party with food, live music, beer, and other activities. Many local resturants donated food such as Holy Hog BBQ, Fuzzys Tacos, East Coast Pizza, etc. Tampa Beer Works will have a variety of craft beers on tap for post race refreshments. There will be an award for top male and female runners. The Mark Tucker Foundation was established in 2014 after Mark passed away suddenly froma brief illness. Mark worked for the Hillsborough County Sheriff's Office for 20+ years. This foundation is a non profit 501C3 with 100 percent of the proceeds benefiting The Lynn Sowers Foundation, The Humane Society, The Spring of Tampa Bay, and similar cooperatives. The goal of this foundation is to give back to the community and to all who are in need.